I love all things gardening, but what do you do when your garden rewards your patience with abundance? It’s time to get into the kitchen. The main reason to have a kitchen garden, to my mind, is for the tomatoes. 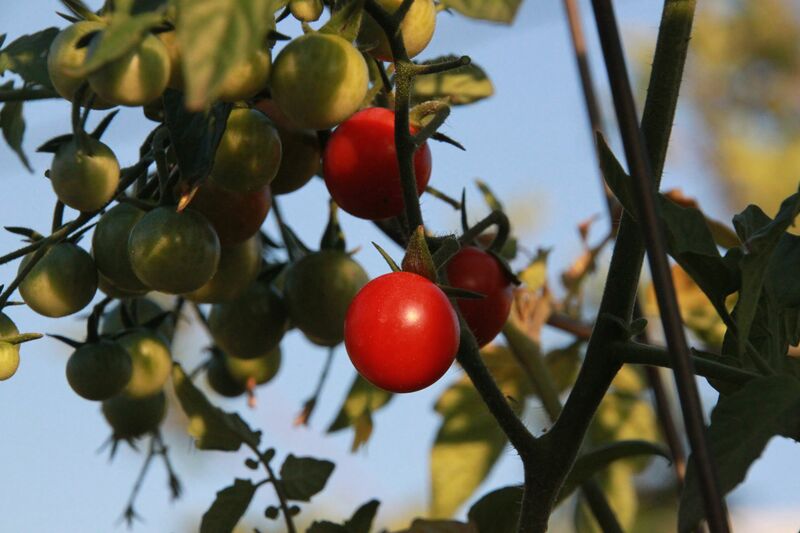 There is nothing more fragrant than a tomato plant, nothing more luscious in the mouth than a sweet tomato warm from the sun. 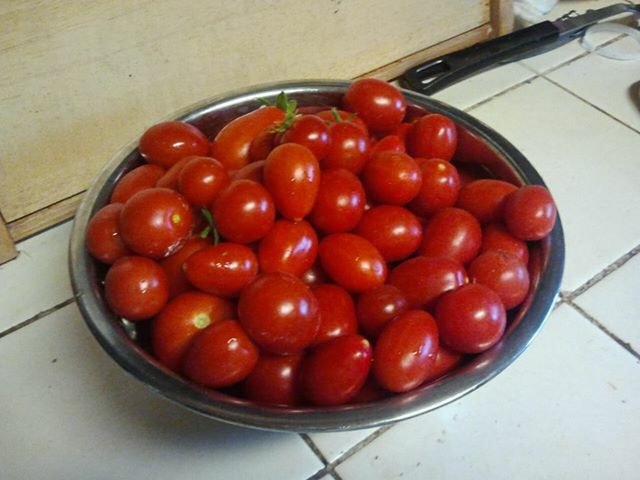 Unless, of course, you nom nom down on the tomatoes while you’re standing outside, and tomato juice drips down your chin…yeah, if you haven’t done that, and you have extra tomatoes on hand, then do I have some recipes for you! This year, we planted three beds with tomato plants. The first bed to go in had the cherry tomatoes (5 plants), the Early Girl tomatoes (3 plants), and the Roma tomatoes (2 plants). Two weeks later, we added an heirloom bed – Mr. Stripey, yellow pear, Pink Brandywine, Green Zebra, Cherokee Purple, and a Mortgage Lifter. Two weeks later, Tom decided to toss in 4 more plants – all Better Boys. So – twenty tomato plants is enough – MORE than enough – for a family of four. Here are some of my favorite recipes using fresh, home grown (or farm stand) tomatoes. Chop as many tomatoes as you wish. You can either make just enough for the one meal, or enough to snack on for a couple of days. Depending on how many tomatoes you use, add in the chopped basil. Drizzle with a healthy amount of extra virgin olive oil, add fresh ground pepper, and mix well. Let stand for half an hour before serving, to allow flavors to meld. Just before serving, sprinkle lightly with salt. This can be used as a salad, or as a bruschetta topping – toast small slices of sourdough, add the tomatoes, sprinkle with some fresh grated parmesan cheese. It will last a couple of days in the refrigerator; add freshly chopped tomatoes to perk it up if needed. The first round of tomatoes, picked about a month ago. Like any good toasted cheese sandwich, you want to butter the outside of the bread but not the inside. Slice the cheese thin enough to melt easily, and cover one slice of bread with the cheese. Add a slice or two of tomato; top with rings of onion if desired. Add one more slice of cheese and top with the bread. Butter the outside of the top slice of bread; add to smoking hot cast iron pan, buttered side down. Butter the outside of the top slice of the bread; flip the sandwich. Press down hard with a spatula in order to melt the cheese faster without burning the bread. Once the bread is golden on both sides and the cheese is melted, the sandwich is done. If you like, make up a bunch of these and cut them in quarters – they make terrific appetizers. Preheat oven to 350 degrees F. On a floured surface, open puff pastry and lightly roll. Cut through pastry to make four pieces. Within each piece, cut lightly (but not all the way through) a half-inch all along the edge to make a border when cooked. Mix together the egg yolk, a couple of teaspoons water and a couple of teaspoons olive oil (measurements don’t need to be exact). Brush egg wash over pastry; using a spatula, move pastry to a cookie sheet. Within the border made by your cut, arrange tomato slices. They can overlap, or they don’t have to; if you didn’t grow them yourself, try the heirloom varieties at the farm stands. Orange and red are pretty together, and the different tomato flavors meld beautifully. Once all the pastries have tomatoes on them, drizzle them with extra virgin olive oil, then sprinkle about a quarter of a teaspoon of white sugar on top. Using a pepper grinder if you have one, grind pepper over each pastry lightly. Put in 350 degree oven and bake for 20 minutes. At that time, pull pastry out, top with fresh basil and parmesan cheese. Return to oven for another five minutes. You can serve either hot, room temperature, or cold. Another terrific appetizer, too – make it using the entire puff pastry sheet, cut into 3″ squares after cooking, and you’ve got yourself a tasty treat. 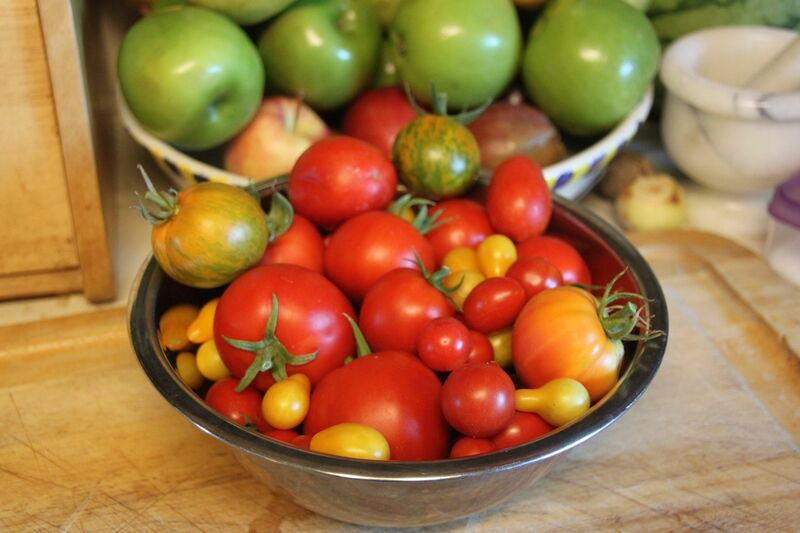 Saturday’s Tomato harvest – the small yellow ones are the lemon pear tomatoes, the small red ones are the cherry tomatoes, the two green and yellow striped ones toward the back are the Green Zebra, and the orangish one at the front right is the Mr. Stripey (but without stripes). One last thing I like to do with tomatoes is make jam. Yes, you heard me. One year my dad had SO many tomatoes, that we made jam – and it was delicious. Sweet, yet tangy, it was just different enough that friends and relatives raved. I got the recipe from the box of pectin. If you want more of a relish, try this Spicy Tomato Jam recipe at AllRecipes, or this fabulous (and a lot less work) recipe for Jennie’s Tomato Jam at Use Real Butter. (I think I’ll use Jennie’s this year!) The best thing about these two recipes is neither use pectin (in case you have a thing about pectin). Are there other tomato recipes out there that you like to use? I’d love to hear from you about your summertime favorites, so drop me a line! This entry was posted in Cooking, My Garden and tagged AllRecipes, Christine Ashworth, tomato jam, Tomato Recipes, tomato tart, Use Real Butter. Bookmark the permalink. Anyone who has grown their own tomatoes, particularly if they try the wonderous varieties available, will never look at storebought tomatoes the same way. Sun-warmed and eaten right off the vine, divine! I really love fresh tomatoes in the garden. I like sundried tomatoes – not really sundried but cooked in a slow oven with salt, pepper and olive oil. The flavor is really intense. Can’t wait for our summer and fresh tomatoes and basil in the garden again, plus fresh strawberries. The plants are in the ground and some of them have flowers already. Ooh Shelley, I’ll have to try your slow cooking of the tomatoes – sounds delish! LOL Donna – So Cal. Come on over!